We have a one visit new patient process. This means that we will give you a report of findings and an adjustment on your first visit. The first visit usually lasts approximately an hour. You’ll feel right at home the moment you walk through the door! Before the adjustment, Dr. Bowman will provide you with electric stimulation and heat therapy. She will then perform the first adjustment. After that, Dr. Bowman will use a traction/massage table, which helps to further increase patient mobility and function. That’s the first visit! Make sure to wear comfortable clothing and bring your health insurance card with you. Dr. Bowman will answer any questions you have before we get started. Dr. 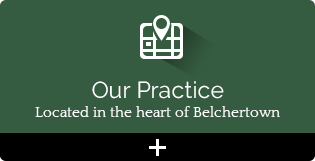 Bowman will map out a care plan with you. Most first-time patients’ care plans consist of coming in three times a week for two weeks or a month. Care plans, however, are entirely dependent on the condition of the patient and how much care and attention the condition requires. 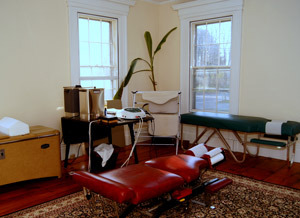 Regular visits take about 45 minutes and always include electric stimulation and heat therapy before the adjustment. Dr. Bowman sees a lot of relief come from the combination of these two therapies. They also prepare the body to be more receptive to the adjustment and holding proper alignment. Electric stimulation decreases pain by stimulating light touch sensors in the muscles that override pain sensors. In addition to decreasing pain, it also helps to reduce muscle spasm. Dr. Bowman enjoys sharing her knowledge with patients, most especially with those new to chiropractic. After giving you foundational knowledge of what chiropractic is and how it works, during further visits Dr. Bowman will also discuss posture and ergonomics with you. She will also show you how to use your body better so that when moving or lifting you don’t throw your body out of alignment. Dr. Bowman also goes through each patient’s unique stressors with them, to show patients how they are affected by the stressors and how to counteract stress. Come in today to experience how chiropractic can help you feel better and move better! Call (413) 213-1114 to schedule an appointment.